Why visit the thermal resort of Edipsos in Greece? It’s a unique resort full with natural hot water springs – they are said to be more than 80 thermal springs across a fairly small area, with temperature of the different springs varying between 28 and 86 degrees. The place had been famous for its thermal water since Roman times and this is evidenced by the Roman Sylla Cave – a small building with a dome and thermal pool area from Roman times, where the healing thermal waters could be enjoyed by the locals. It is named Sylla Cave after the Roman general Sylla, who was frequently visiting the cave. Most of the thermal springs have been captured and are carefully protected, but there are so many of them that walking around the residential area of Edipsos you can see (and smell) the channeled thermal water literally everywhere! Try dipping your finger into some of those – but not other body parts as you can get seriously burned, the water is super hot! 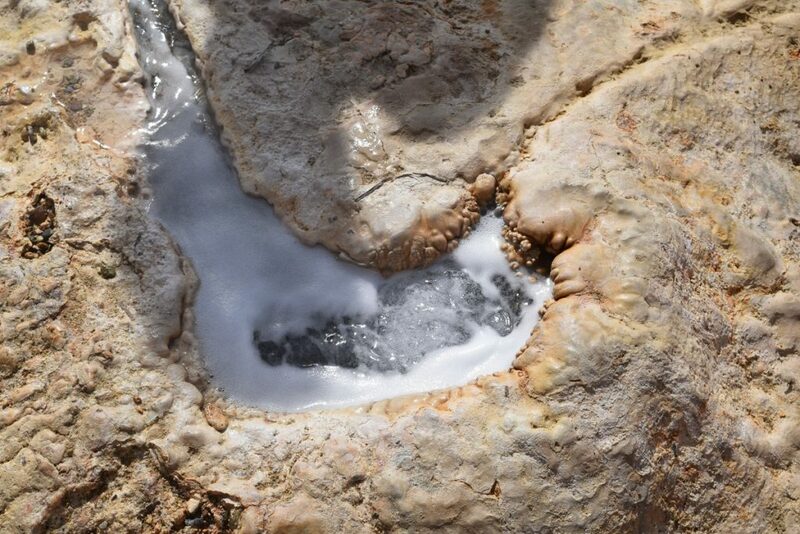 Try dipping your finger in this thermal water – it’s super hot!! The most amazing part of it all is – Edipsos is right on the seaside of Evvia island. 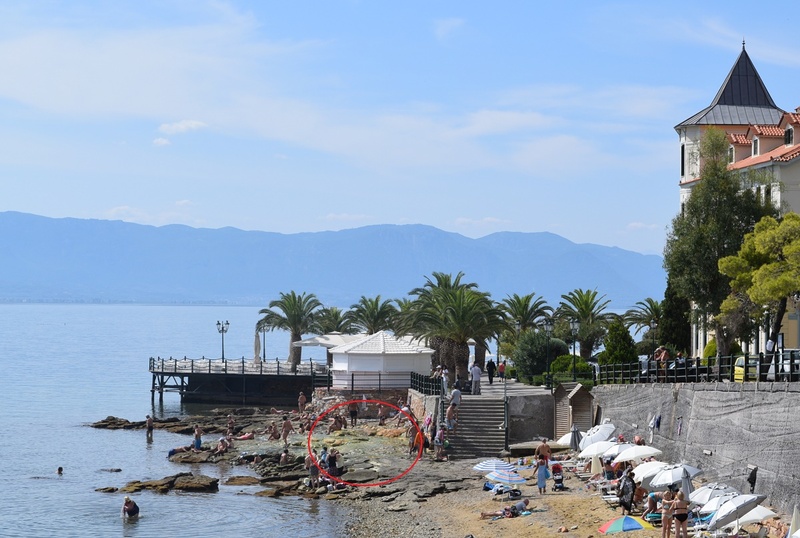 So, there are mineral springs right next to the sea and even inside the sea! A-ma-zing! And all those are free to use, day and night. Of course, there are crowds at specific times of the day but- given it’s free and awesome, just visit early or late throughout the day. Or simply go outside the high season! And after you got hot 😉 – enjoy the beaches all around Edipsos. Most of them are pebble beaches but – read downwards – there are awesome sandy beaches just 30-40 kms to the north. Edipsos is in the northern part of the island of Evvia. And even though it’s an island, it’s been connected to the land by a bridge, in its southern part. The straight there is fairly narrow (~40 m) so it was easy to build a bridge as early as 5th century BC. This bridge is now much improved and handling a lot of traffic. So, if coming from Athens, you can rent a car or take a bus to Edipsos and use the bridge. If coming from Thessaloniki, the fastest option is the ferry from Glypha (departs every 2 hours). From Glypha, it takes 25-30 minutes to reach the island and then another ~15 km to reach Edipsos. What to do in Edipsos? The natural, free and amazing outdoor pools are just outside Sylla hotel, right at the seaside. Even if the weather or sea is not that warm, they are bound to warm you up, the mineral water there is truly hot! In the summer those are pretty full but everyone finds a spot for him/herself, in the end. Walk some 50-100 meters to next beach and you will get thermal water springs, inside the sea, inside the rocks, dripping from the rocks above you – literally everywhere! It’s amazing to swim in the sea and feel at some point the water getting truly warm at some places..then you understand you must be right upon a thermal water spring outlet, inside the sea! 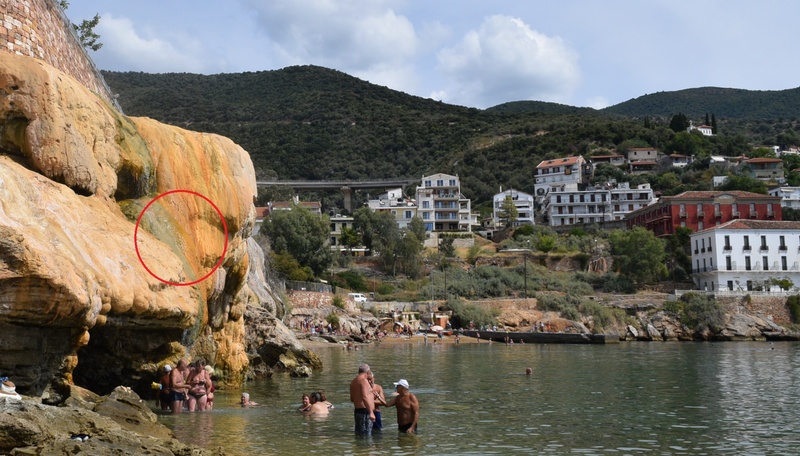 If visiting Edipsos in really cold weather, you might consider booking a hotel having their own covered thermal pool. But you may as well stay anywhere and enter the thermal pools of other hotels for a small fee, most we checked had such an option. Lihadonisia islands are a group of 7 very small islands, just off the farthest north-western part of the island. They are said to be the Maldives or Seychelles of Greece, with spectacular sea bottom and shipwrecks to be enjoyed by divers. These islands have awesome sandy beaches and lots to see on a kayak or small boat. 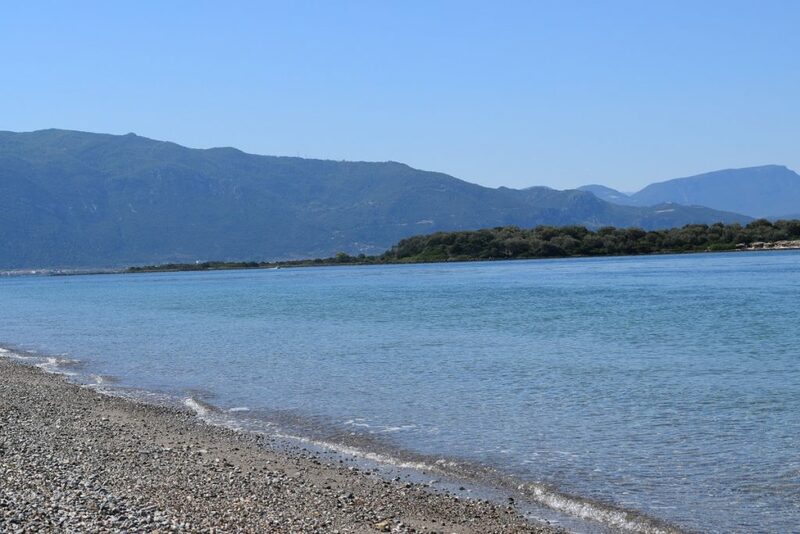 You can reach the islands from Kavos port – numerous boats are departing every half an hour or so, taking you to the organized beach on the biggest island of Manolia. You can base yourself there and explore the island of Manolia by foot, checking out remains from earlier settlements on this island. Today there is only one small chapel remaining active on this island (no inhabitants) and it is still used for marriage celebrations. Other than that there is a nice beach bar and really shallow bay, perfect for swimming with kids, without all that jellyfish bothering you (lots of interesting jellyfish was swimming outside the bay). If you have a whole day though – consider visiting the smaller islands as well, using one of the boats going around or with a kayak. You can find more sandy beaches, some are really secluded, as well as visit the shipwrecks around. Drimona is a small village some 40 kms from Edipsos, high in the hills. Signs will guide you to the beautiful Drimona waterfalls close by. The nature around the waterfalls and the waterfalls themselves are worth visiting and there is a well-done tourist road to access the sight. Despite claims in various sites that the waterfalls have water only in spring, in later autumn they were still there. If you’d rather walk more into the woods before you reach the waterfalls (than the 20 minutes from the road where you park the car) – you can as well take some of the trekking routes to this natural sight. Nearby the waterfalls is also the Monastery of St David – impressive and offering really nice views from the top. 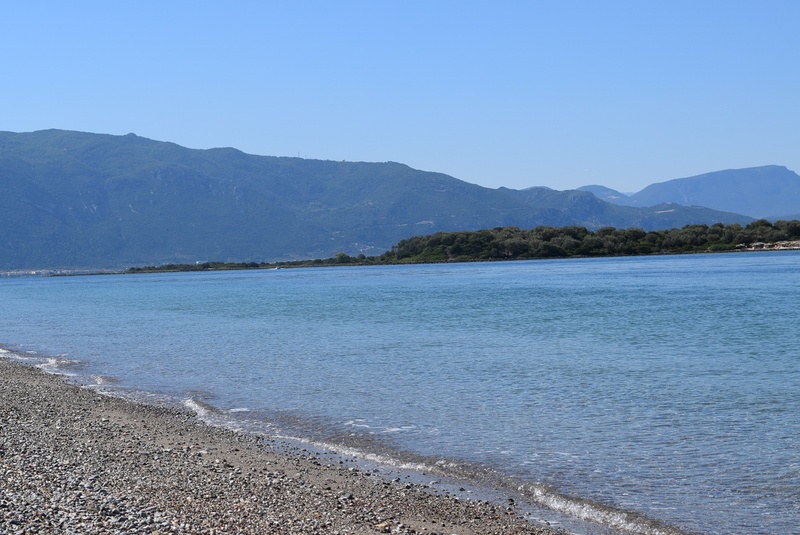 Edipsos has a residential and resort part – make sure to stay in the resort one since it’s right at the seaside and next to the thermal water springs. 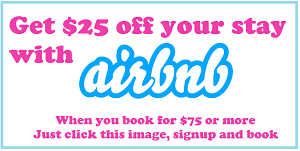 We booked ourselves an apartment using Booking.com – very affordable and right next to the seaside. 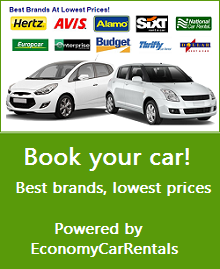 Book your place from this link for 10% off your booking.com reservation. Plenty of parking options, lots of cafes and restaurants on the main streets, delicious pastries in shops around the resort so – definitely a convenient place to base yourself to explore the island of Evvia. Hope you will get a chance to spend more time on it – Enjoy a totally relaxing time on this piece of heaven!